THE REVIEW OF the rising costs of the National Children’s Hospital will not be able to find any individual liable or culpable for the skyrocketing overruns. 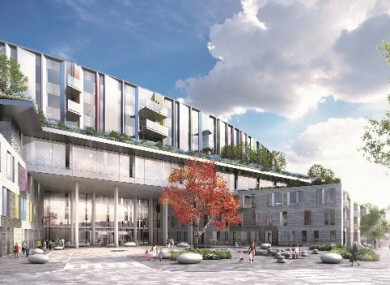 Under the terms of reference, the PwC review won’t be permitted to assign or suggest blame to any individual involved with the hospital build, but will examine how the total cost of project is now estimated at €1.7 billion. The Oireachtas Public Accounts Committee yesterday heard the total cost of the project is “highly unlikely” to come in under €2 billion. While the terms of reference does not to assign individual liability, Health Minister Simon Harris said he wanted to be very clear that there will be accountability. People will be held to account, there will be governance changes in relation to this, of that there is no doubt. The minister said he is very frustrated that there weren’t early warning systems in terms of the governance structure, which he said was in place. “So I intend to hold people to account. I intend to make changes in terms of some of the people involved and the management and governance of the project,” said Harris. Commenting this evening, chairperson of the Health Committee Dr Michael Harty said he thinks “the Department of Health [is] in serious trouble”. When asked if he holds Harris to account over the children’s hospital issues, Harty said: “I’m not one for calling for resignations but I do expect people to take responsibility, and if part of that responsibility is resigning well that’s what should happen. Fianna Fáil health spokesperson Stephen Donnelly hit out at the fact that there will be no personal accountability. “I find the decision not to hold anyone accountable for this catastrophic failure utterly bewildering,” Donnelly said. “If it weren’t so serious it would be laughable that neither the government nor the HSE are overly concerned about providing accountability or having a board in place that they are absolutely confident will deliver this project in line with the public’s expectations,” he said. Harris earlier said he was anxious that people do not lose sight of the importance of the project – a development that has been talked about since before he was born, he said. “I don’t want this to take away from the fact that this project is so important for a third of our population – who are kids and are relying on us to do this. When the cost overruns first came to light, the minister said he was faced with a decision on whether to proceed with the project or not. “If you were in my position and you were presented with three choices – pause the project – I wasn’t going to do that, kids have waited too long; re-tender the project when all the evidence is it would add to the cost and add to the timelines; or build the project – which would any of my political opponents have taken?” he asked. Email “Children's hospital review stops short of 'assigning blame' but Harris says people will be held to account”. Feedback on “Children's hospital review stops short of 'assigning blame' but Harris says people will be held to account”.